Greetings All! Once again I have to face the shame from lack of blogging production. I’ll spare you the details since I’ve already mentioned my current workload in previous posts. Taking a positive position I was able to break away from the toils of the day (or rather the wicked humidity of the day) to put out a quick post. 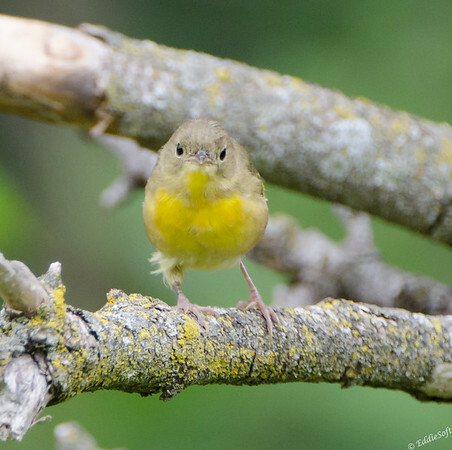 Back to the birds for today’s featured critter. Kind of cute don’t you think? This little girl comes to us from a few years back. I was doing some hiking in my favorite park – Jubilee College State Park all the way back in August of 2014. I’ve featured this park in numerous posts being as it is where I spend a good part of my spare time either training for runs (every other day) or catch a bit of hiking or birding. Safe to say I am familiar with just about every inch of that park. Oh, and it doesn’t hurt it is only a mile from my house. From a birding perspective, there are several good spots in the park depending on what you happen to be looking for. Want Eastern Bluebirds or Indigo Buntings head up to the flats near the pavilion areas and simply close your eyes and take in their sweet songs from every direction. Prefer raptors or woodpeckers, hang at the edge of the tree lines along the fields or make your way through the wooded trails. It pretty much has an ideal environment for every Midwestern bird species somewhere in its 3,200 acres. Hit the jump to find out what kind of bird this is. My favorite birding spot happens to be at the small pond inside the campground area. Except in the heart of summer when the pond gets its annual coating of algae, that area is full of activity and thus a target rich setting for wildlife photographers. I never actually see any fish in that pond, but the birds definitely enjoy the insects and the crawfish that are abundant – DO NOT FORGET YOUR MOSQUITO SPRAY. If you go to the east edge of the pond, there is a trail that heads off into the bottoms to the north. It can be a bit soupy in the bottoms and if snakes or ticks make you anxious you might want to make someone walk ahead of you. I keep telling my brother that I’m going to head out there one day and build a quick platform we can stand on to keep our shoes dry while scanning the area for interesting birds. It is here where I spotted Little Miss Yellow hanging out in some brush. She was busy hopping from branch to branch in search of small insects unlucky enough to be in her hunting zone. Now the female coloring can be a bit difficult to identify being a fairly generic brown and yellow palette that a number of female species sport. Her male counterparts are exactly the opposite and extremely easy to identify. They have a black mask through their eyes with a white band at the top and a bright yellow below. 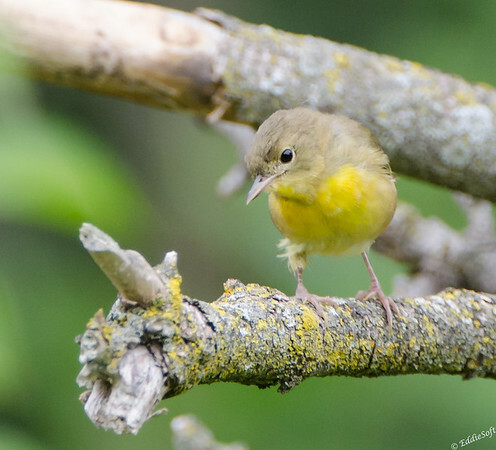 – Unfortunately, the male Common Yellowthroat was nowhere to be found… nor heard. This female was keeping quiet for the entire time I was watching her and to be honest I am not entirely sure they have the same distinctive call as the male (Cornell only referred to the male’s call). If you have not heard the male’s call, it sounds exactly like “witchety-witchety-witchety“. Ron has an incredible ability to pick out this call instantly – amazing, but extremely helpful if you are trying to get that species checked off for the day. A few quick facts before heading off to bed. 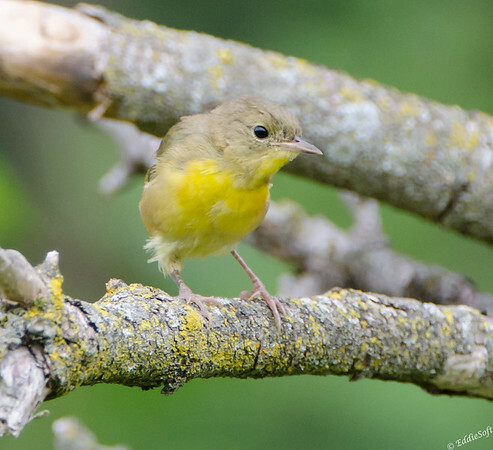 First off, these Yellowthroats can be found just about anywhere in the lower Canada territories, all of the US and then down into Central America. Always a bit intriguing to see the breadth of their region being that I never really knew what one looked like until I moved to this area after college. There isn’t much else worth mentioning about this particular bird on Cornell’s site – does appear that the male is dedicated to having one mate in his territory, however this cute and innocent looking bird doesn’t share the same level of commitment. Apparently the female will lure other males into the area with their calls and mate with them behind his back. Have to leave it there – have 13 miles to force myself through tomorrow and it looks like the humidity is going to be bad! Really like the Warblers, we get the odd one or two species blow across in the autumn, but I’ve not been lucky to see any, always hundreds of miles from home on some remote island! We are lucky enough to have them come through on their migrations in the Spring and Fall giving us a great opportunity to see all those incredibly colored birds. This is one of those that tends to stick around for the summer than running up to the cooler lands to the North. Thanks for dropping by and sharing your thoughts Brian! What a cute little bird! Kinda neat that the yellow in the branch accents the yellow in the bird. 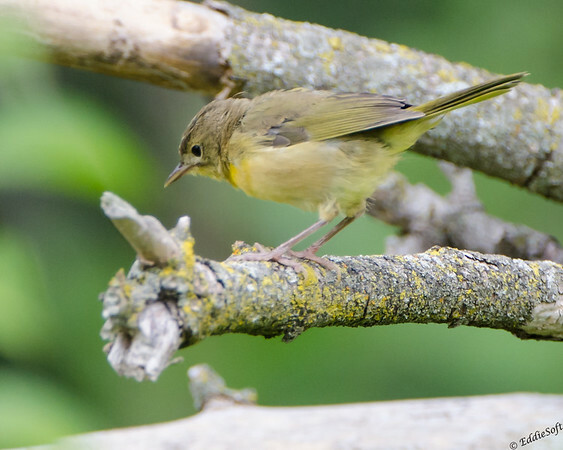 I’ve grown to like the more muted female coloring on some birds, although the male Common Yellowthroat looks fantastic. With its black mask you have to get a shot with glint in the eye or you lose the eye entirely in the black. My struggle with the muted coloring is pretty soon they all start looking alike – I call it the Sparrow Quandary…. and as far as tick and snakes go, I think you have to agree, I/m usually the one out front in our hikes partly due your irrational fear of ticks (the other so I don’t smack you in the head with The Beast). Fortunately, I know how to get back at you – just simply inform you that I found ticks on me while you still have a long trip back to Chicago. Pretty sure by the time you make it home you are totally paranoid hehehehehe. By the way, totally impressed with your short post to comment span as of late – very appreciative!